Can this passive GPU cooler keep your HD 6850 silent and deadly? We got our thermal paste covered fingers on the latest passive GPU cooler from ARCTIC, snappily named the Accelero S1 Plus. Designed to plonk right on top of a Radeon HD 6870 (among many other cards), this chip chiller aims to keep your GPU cooler and quieter. But why would you want to upgrade your stock GPU cooler, we hear the uninitiated ask? Stock GPU coolers are generally just about good enough. If you're just using your graphics card in your normal desktop machine with no thought to overclocking, then you can pretty much just leave it well enough alone if you want. If, however, you really want to push your GPU to its limits, then replacing the standard cooler with something more heavy-duty is the best way to do it. There is another reason to change out your GPU cooler though and that's silence. 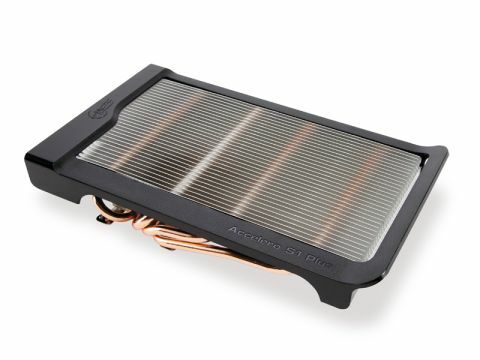 If your whining graphics card is driving you to distraction then you may want to think about changing to a passive version such as the Arctic Cooling Accelero S1 Plus. The top passive graphics card we've seen is the Asus EAH6770 DC; that's about as powerful a graphics card as you will want to try and cool without messing with spinning blades. But wait, this here £20 passive replacement cooler is capable of sitting pretty on the current budget GPU of choice, the HD 6870. Bonus. Sadly, no. While it does happily fit, after a little thermal paste mixology and some fiddly screw-driving, it simply isn't conductive enough to adequately cool such a graphics card on its own. The basic Sapphire cooler on our Radeon HD 6850 kept it to 62°C under load while the Accelero S1 maxed the GPU out at 105°C. It was certainly quiet, but way too hot for continual use. You can try putting in a 'turbo module' for the Accelero, which is a chunky 90mm fan that will provide more cooling. It should turn out to be quieter than the standard Accelero, but if you're hoping for some fairly high-end, passively-cooled gaming it's not going to be found here.